This recipe is the O.G. 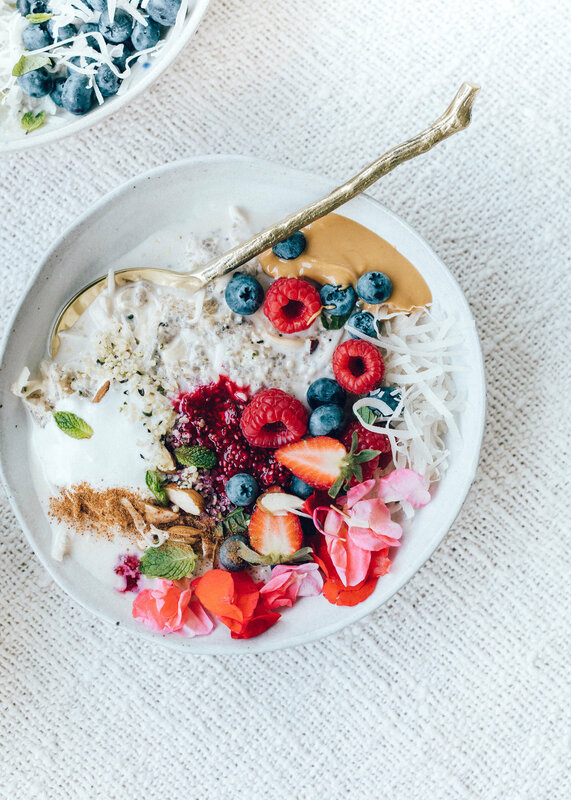 Version of the VETO Bircher in my NEW VEGAN KETO EBOOK that we released on The Wholesome Store this week!!! You will find 3 variations of this recipe inside the eBook, PLUS over 50 pages of my 20 favourite Vegan & Keto recipes with beautiful images, including the nutritional breakdown of each recipe! If you haven’t already checked it out then click HERE to grab yourself a copy. This recipe is packed with healthy OMEGA-3 fatty acids from hemp, chia & flax seeds, what we call ‘Essential Fatty Acids’. Inside my cookbook ‘Elsa’s Wholesome Life’ I talk more in depth about the importance of prioritising Omega-3 FA’s over Omega-6 in the diet. These little seeds, and the psyllium husk also provide a good amount of fibre to start your day PLUS calcium, iron & potassium. This recipe is LOW in sugar. I add a touch of stevia to sweeten the recipe. Stevia is a plant, hence its totally safe and natural and a great sugar free alternative. I think the combination of vanilla, berries and coconut give it a smooth and velvety sweetness, hence you may decide it doesn’t need any stevia at all. Berries are used in this recipe as they’re naturally low in sugar (because they contain some sugar alcohols - (sorbitol) which sweeten them but are non-absorbable) but are super yummy AND are bright little micronutrient bubbles! (Vitamin C & antioxidants). Add all dry ingredients to a bowl (or container for a grab and go breakfast the next day), stir together and then add the remaining wet ingredients (coco milk, water, stevia, & vanilla). Optional step: PIMP YOUR BOWL - add the carrot cake ingredients or ZOATS ingredients - recipes in my VEGAN KETO eBook. Stir mix together, it should be quite runny as the seeds will expand and soak up most of the liquid. You can add more water or coconut milk to adjust to your desired thickness. Top with the topping ingredients now (or you can do this in the morning), cover and place in the fridge overnight to set. Sugar free sweeteners are all different in terms of potency of sweetness compared to sugar, I use enough to equal ~ the sweetness of 1 tsp of sugar/maple syrup. For the coconut milk, I mix 1 can of coconut milk with 1 can of filtered water, shake and place into milk bottle in fridge. This is a much more economical way of utilising coconut milk as canned coconut milk tends to be thicker than other plant milks. Hence 1/4 cup coconut milk used is equivalent to 2 tbsp (30mL) canned coconut milk. You can also do this with coconut cream, adding 2-4 cans filled with water. Always try to buy coconut milk that doesn’t contain added ingredients. Look for: coconut flesh, guar gum and water only. Hope you love this recipe beauties!